It is our pleasure to introduce you to our spine surgery fellowship! Through the years, our program has developed into one of the most comprehensive, well-balanced training programs in the United States. Since 2008, our fellowship has been ACGME accredited. Only 18 spine surgery fellowship programs in the United States have this distinction. The accreditation was associated with formalizing the program design and its contents to ensure that it is education based and well-rounded. The program is administered through the Texas Back Institute Research Foundation (TBIRF) with clinical and surgical training at the internationally recognized Texas Back Institute (TBI). The TBI/TBIRF Spine Surgery Fellowship was initiated in 1986. At the time, one fellow participated in the 12 month training program. With the growth of the practice, more fellows were gradually added each year. Currently 5 surgeons are trained each year. To date, 95 Fellows have been trained who now practice throughout the United States and in Puerto Rico. Dr. Richard Guyer was the founding fellowship program director. In 1996 when Dr. Jack Zigler joined TBI, he brought years of experience serving as the fellowship director at Rancho Los Amigos in California and became the co-director of the TBI program. The TBI Fellowship Program is ACGME accredited and lasts one year, from August 1st-July 31st, allowing orthopaedic surgeons and neurosurgeons to be trained in the evaluation and treatment of a variety of spinal disorders, with an emphasis on degenerative diseases and spinal deformity. The program offers a well-rounded experience with varying philosophies of care as well as multiple surgical techniques in a busy academic oriented community practice that attaches supreme importance to quality patient care, education, and research. The Texas Back Institute Research Foundation is responsible for the program’s administration, curriculum development, and implementation. Fellows work directly with multiple faculty-mentors at the Texas Back Institute. Fellows see patients in clinic with attending surgeons, learning how to diagnose and manage spinal disorders, as well as assist with operative cases to gain experience in multiple surgical treatments. Additionally, fellows will learn how to administer injections and implant spinal cord stimulators. Each fellow typically assists with more than 300-400 procedures during his/her fellowship year. Academically, all Fellows prepare and present educational lectures, lead discussion of articles at Journal Club, attend national conferences, and conduct research. TBIRF staff and TBI faculty facilitate and mentor Fellows as they conduct research, and present and publish their research findings. We continually modify the program to meet the changing learning formats and needs of our fellows. One of the cornerstones of the TBI spine surgery fellowship is a balanced program. Fellows develop a solid foundation of traditional procedures such as open discectomy, decompression, fusion, pedicle screw placement, etc. Also, they learn minimally invasive procedures, robotic-guided pedicle screw placement technology, motion preservation innovations, and spinal cord stimulation, etc. The primary educational content for a fellowship program is refining diagnostic and surgical skills. While addressing these clinical needs, our program is also designed to include preparing fellows for a successful transition into practice. Topics addressed during the year include tips for selecting a practice that will be a good fit for your career and lifestyle goals, contract negotiations, coding, building your new practice, compliance, dealing with potential malpractice cases, and other areas. Richard Guyer, MD has held the position of Spine Surgery Fellowship Program Director since Program’s inception in 1986. He is a fellowship-trained spine surgeon and is certified by the American Board of Orthopaedic Surgery. Dr. Guyer has served as the President of the North American Spine Society (NASS) in 2006-2007 and has served in many other society positions. Jack Zigler, MD is the Fellowship Co-Director and has held this position since 1996. Before coming to TBI, he was Fellowship Director at Rancho Los Amigos Medical Center from 1982 to 1996. He is a fellowship trained spine surgeon and is certified by the American Board of Orthopaedic Surgery. Dr. Zigler served as President of the American Spinal Injury Association and has held several positions with the Cervical Spine Research Society. The attending faculty for the Fellowship program have a wide range of expertise. Through this exposure Fellows gain knowledge on treatment strategies and options. They can use this exposure to determine which specific techniques they want to use when beginning their own practices. Below is a brief overview of the areas each faculty member addresses. There are five rotation services under the mentorship of thirteen faculty members with fellows completing 10 weeks on each rotation. Fellows will typically scrub on 300 to 400 spine procedures each year as well as participate in clinic. Rotations allow for approximately 1-1 ½ days in clinic, and 3-3 ½ days in the operating room each week. There is designated research time scheduled into the rotations. Fellow participation in the multiple faculty rotations helps to ensure exposure to a wider patient mix that includes deformity, trauma, and persistent chronic pain. A log of surgeries in which the fellows participate is maintained and can be reviewed to determine if the fellows are continually being exposed to a wide variety of cases. Fellows are required to attend and participate in four in-house educational conferences. Fellows equally share on-call responsibilities. The academic program in the Fellowship includes regularly scheduled Neuroscience lecture series, Interesting Cases and M&M, and Journal Club. Some of these activities are CME accredited. The Neuroscience lectures provide in-depth information on diagnostic, treatment, and practice related topics. Interesting Cases and the M&M series create a forum for discussion of challenging cases, treatment options and complication management. The monthly Journal Club meeting is designed to refine critical reading skills and to discuss how to translate the literature into clinical practice. In addition to the educational activities held onsite, Fellows are encouraged to attend professional society conferences and other educational activities. Attending spine specialty conferences is an important part of education, not only for fellows, but also after transitioning into practice. Travel stipend and education days are allotted for fellows to attend such meetings. 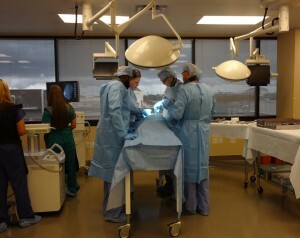 As a part of orientation, one annual event is the Fellow-to-Fellow cadaveric hands-on spine surgery lab. Our graduating fellows teach incoming fellows from the perspective of “what I wish someone would have taught me the week before starting my fellowship” with emphasis on technique tips they have learned from respective attending through the year. It is also an opportunity for the graduates to realize how much their skills and confidence have developed during the training year. Graduating Fellows serve as faculty for the incoming group at the annual Fellow-to-Fellow lab held each year during orientation. Fellows are given a portfolio that includes a rotation curriculum for each 10 week service, a checklist of required skills to be achieved, ACGME competencies and conference schedules. Texas Back Institute surgeons annually donate their time and skills to participate in surgical missions in Africa. Fellows who wish to travel with the attendings to participate in this life and career enriching experience have the opportunity to do so. The trip is usually for a two-week duration. The TBI Research Foundation has a designated medical library containing orthopaedic and spine surgery related text- books, journals, and other periodicals. Electronic access is available to most major spine journals, including neurosurgery and pain management. Additionally, an electronic library is maintained with relevant spine related articles. A designated fellow computer, printer, lap-top, camera, and x-ray view box are all accessible to the fellows in their office area. 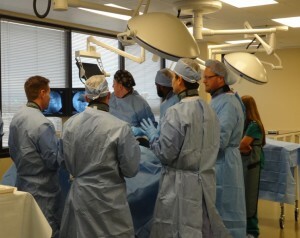 Fellows participate in additional educational and surgical skill training courses held in the medical conference center and cadaveric training lab located in the same building as the TBI Plano clinic. TBIRF staff and the Program Directors continually identify and evaluate web sites that provide good quality educational materials. Clinical and surgical training for the fellowship program are performed through the faculty at the Texas Back Institute (TBI). TBI has grown to be one of the largest free-standing multidisciplinary academic spine centers in the Unites States. Throughout its history, TBI has been an innovative leader in clinical practice, research, and education. One of the strengths of the fellowship program is the diverse experience and expertise of the TBI attending faculty. Within the practice, surgeons specialize in trauma, deformity, tumors, total disc replacement, minimally invasive surgery, robotic guided surgery, vertebral compression fractures, various interbody fusion techniques, injections, spinal cord stimulation for pain management, and other areas. This broad spectrum of exposure allows fellows to determine which specific approaches they will want to employ upon entering practice. In 2010 the Scoliosis and Spine Tumor Center formally opened as a part of the Texas Back Institute and Texas Health Presbyterian of Plano. The center is led by Dr. Isador Lieberman. Fellows learn details for patient evaluation and strategies for operating on complex cases involving scoliosis, interspinous implants, kyphosis, and spinal tumors. One of the highlights of the surgeries performed is the incorporation of the robotic guidance for pedicle screw placement. Graduates of the fellowship program now practice throughout the United States and Puerto Rico. It is gratifying to know that the training received during the fellowship is continually impacting patient care throughout the country. There are many housing options available in the north Texas area. Leasing a house with a yard is generally not a problem. There are also many options for apartments including Legacy Park which is a relatively new area designed to recreate the feel of an urban community in a suburban area. As in any region of the country, costs of leasing vary greatly with size, quality, and location of the house or apartment. In general, a 3 bedroom house leases for about $1,600 per month, with 4 bedrooms costing $2,000. Rent for a one bedroom apartment ranges from approximately $600 to $1200 and for two bedrooms ranges from $750 to $1,500 per month. Schools in the Plano area have long been noted to be among the best in the state and the nation. The schools consistently receive an “exemplary” rating.There are also excellent private schools available. The Dallas / Fort Worth Metroplex offers a wide variety of venues for entertainment. In additional to the professional baseball, basketball, football, and hockey teams, there are minor league baseball and hockey teams. Rodeo is also a great sports attraction as is racing at the Texas Motor Speedway. There are numerous golf courses that can be played year round as well as participation in cycling and jogging. In addition to sports there are numerous concerts of all genre, museums, weekend festivals, water and other theme parks, and the famous State Fair of Texas. Weekend trips can easily be made to locations for hunting, fishing, camping, and visits to unique Texas attractions such as the Dinosaur Valley State Park, Fossil Rim Wildlife Park, wineries, and the Texas hill country. There is a great deal of diversity in the North Dallas area as evidenced as the varied ethic festivals, restaurants, religious affiliations, and cultural-based shops. It would be a challenge to not find a restaurant to suit any particular taste. There are many organized sports activities available for youth and adults. There are also many parks in the area as well as great shopping. If spouses have free time, they can participate in many courses through the city and community college designed for personal enrichment or just to have some fun and meet people. Every year at the North American Spine Society (NASS) conference, TBIRF hosts a Friends & Fellows reception. It provides an opportunity to stay in touch with the faculty, staff, former, current and future fellows, international visitors, and other members of our training program family. Fellows are always invited to stay in touch with their mentors and the Texas Back Institute administrative team throughout their career. Fellows are always invited to stay in touch with their faculty mentors and the TBIRF administrative team throughout their careers. To join our dynamic and comprehensive spine surgery fellowship, we invite qualified candidates to apply for our program. Applicants must be board eligible (or certified) and must have completed an accredited orthopedic surgery or neurosurgery residency program in the United States, Canada, or Puerto Rico. Eligibility for a full, unrestricted Texas medical license is required. To obtain additional information, please contact the Fellowship office via email: apark@texasback.com or call (972) 608-5148. For more information about our spine surgery fellowship: please contact Amy Park, Fellowship Program manager, at 972-608-5148 or by e-mail apark@texasback.com.